Laval Lucas-Perry is settling in at Michigan. Former Flint Powers all-stater and current sophomore shooting guard at the University of Michigan, Laval Lucas-Perry, says he aims to get Michigan back to national prominence. LLP was a late bloomer in high school. He was young for his grade and really didn’t come into his own, at least athletically, until his senior season. 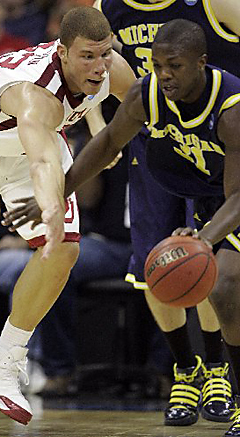 His younger brother, Patrick, is among the state’s best guards in the class of 2011. Over the weekend, LLP was interviewed by Patrick Hayes of the Flint Journal. You transferred in when the Michigan program had been kind of down for a while, what made you decide to come here and then what was the success like last season around campus? It was Coach Beilein. Coach Beilein’s a great mentor, great coach. He had a vision, he could rebuild this program and I think that he saw he had the players and recruited well to do it. Michigan needs to be back on the map like we were back in the day when Cazzie Russell and the Fab Five and all of them were around.